With the summer solstice rapidly approaching, I decided to pay homage to Spring, and all its fabulous produce. We've been eating this salad for the past few months, and figured I better share before it's too late. 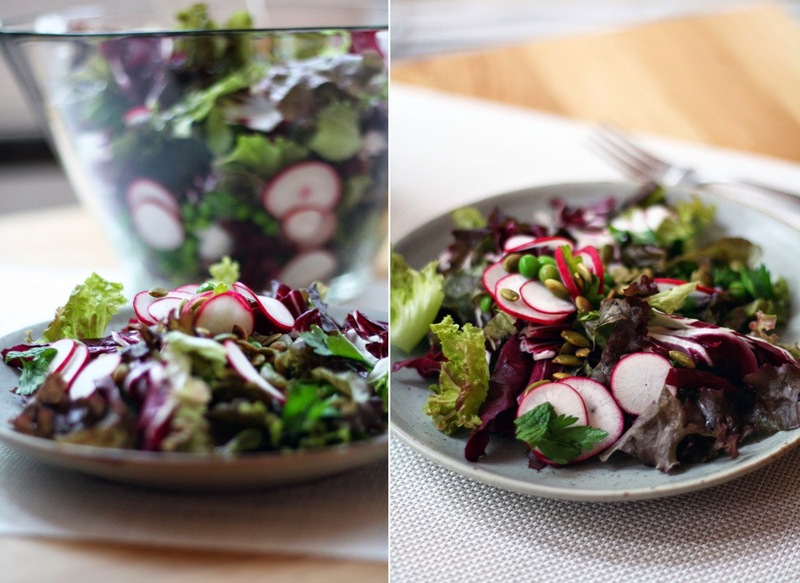 Simple yet delicious, this salad hits all the right notes -- fresh, crunchy, varied ingredients, and the most perfect vinaigrette -- the ideal side for any dinner. Though I could probably eat radishes every day, I am so pumped for summer and all the gorgeous fruit is has to offer. Pretty sure I experienced a strong dose of summer produce envy the other day. Combine all the salad ingredients in a large bowl. Toss to combine. Place the vinaigrette ingredients in a glass jar, and shake vigourously. When ready to serve, dress to your taste, toss and serve immediately - no one (other then my sister) likes soggy, wilted lettuce.